Let's say it up front: this little boat, with a hull length of just 4.7m, is undoubtedly the most stable and comfortable under-5m conventional hull boat I have ever tested. This is in no small part due to a relatively shallow deadrise of just 12 degrees at the transom and the wide chines. 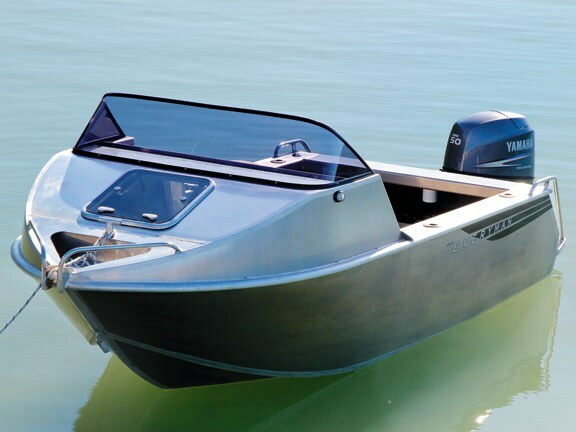 Although most manufacturers focus on the mid- and upper-range of the trailer boat market, there is increasing demand for smaller, entry-level boats with low maintenance costs and easy handling. The challenge is to make sure these are still safe and family-friendly. As a response more small boats are being designed with cabins that can cope with our often inclement weather. 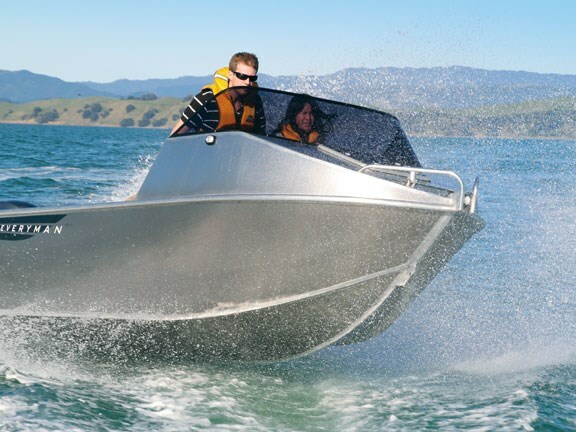 The Everyman 470C follows this trend, with a cuddy cabin and windscreen providing shelter from wind and waves. And it's a good-looking little boat, with its cabin and tinted windscreen in nice proportions to the hull. Designer and builder Nigel Langdale has wisely opted to make the most use of the limited space and has kept the cabin sides and top relatively flat, while avoiding a "blocky" look by creating smooth, rounded cabin edges. Grabbing an unexpected clear and calm day in the middle of July's torrential rain, we headed down to the beach at Maraetai. Viewing the boat from above as we launched, it was clear that the bows are well rounded, which helps to maximize the interior space. The beam is 1.86m, wider than many competing brands, which boded well for the stability and available space. This is a relatively basic boat – the two pedestal-mounted seats weren't upholstered, although seat cushions can be fitted. The standard plastic seats were comfortable enough for a couple of hours. The cuddy cabin is really a storage area only, and no attempt has been made to squeeze seats in there. However the large forward hatch opens for access to the anchor, and a step has been welded into the bow to stand on to get up through the hatch. Setting and retrieving the anchor is easy, with a solid, welded bollard and a large, self-draining anchor well to stow the hook and rode. A large buoyancy chamber is welded into the the hull, giving the boat a flat checker-plate deck with no surprise steps. Welded footrests provide a good support while seated and also serve to stop gear sliding out of the cuddy area. 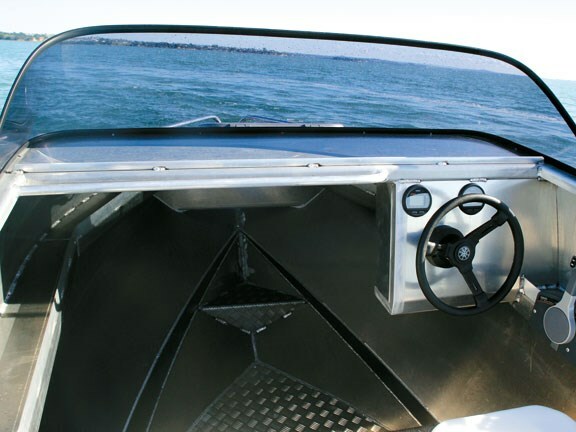 The helm has a single flat panel dash for mounting instruments, and while not extensive it is adequate in a boat this size. The top of the dash is a really useful flat surface, helped by welded edge to stop items sliding off. There is also a sturdy grab rail over most of the width. The helm position was comfortable for both standing and sitting. It has to be said that the quality of the welding around the dash area was below Everyman's usual high standard (and below that of the rest of the boat). It turns out that the review boat was the prototype of this model and was rushed to get it finished in time for the Auckland boat show. Future production models would have a more consistent finish. The cockpit area is generous, and although you will probably not take this size boat out fishing with four adults, there would certainly be space for them to fish. The gunwales are wide and comfortable and have four rod holders are fitted. There is no bait board, or provision for one, but this is available as an option or an aftermarket add-on. The transom has no step-through, but it's easy to step over. Parcel shelves run under the gunwales and extend under the transom, with the battery box tucked on the starboard side well. Of course any water that gets in is quickly taken care of by the automatic bilge pump fitted. A standard tote tank provides juice for the engine, and there is space for a second one on the other side. Clearly Langdale has practical experience of this size boat as he has welded a retaining strip to stop the tote tank sliding around. 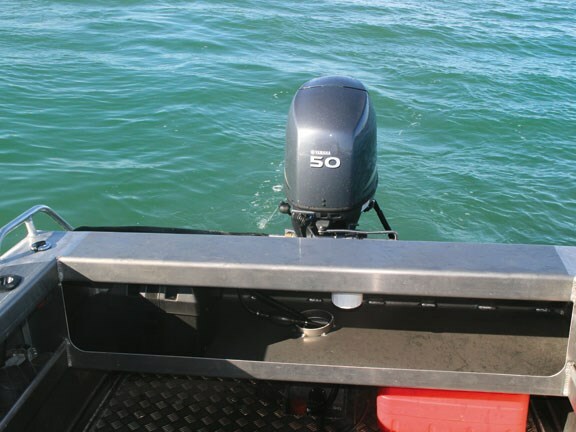 The boarding platform is unusually generous for such a small boat, and there is enough space to comfortably stand on while fishing or for a swimmer to climb up onto on either side of the motor. Although there is no boarding ladder one could be fitted. Langdale fits extra plates to the transom below the waterline for mounting transducers and speed pickups on all his boats. This eliminates the risk of putting a hole through the hull when fitting these, and is another example of the little touches that go into Everyman boats. Under power the 50hp motor proved to be a good match for this hull which is spec'd from 40 – 60hp. She transitions to the plane easily and even with three adults on board, there was no issue with speed or acceleration. We found there was no need for more power, although those that regularly take out a lot of gear may choose to opt for more grunt. Without electronics fitted (beyond the standard engine instrumentation) we could not check speed, but the boat seemed to get into the high 20s with a little power still in reserve. Throwing the boat through larger wakes proved that a shallow deadrise does not necessarily translate into a harsh ride. The lack of planning strakes allows the boat to land with surprising softness, and the fine entry cuts through wakes rather than launching off them. Thanks to the wide downturned chine the boat tracks well through turns and on the whole the boat heels very moderately, even in tight corners and feels very safe and comfortable. That downturned chine took care of most of the spray, and the windscreen remained dry. Conditions on the day were certainly good, and on a windy day no doubt there would be more spray, but overall the occupants will remain dry and comfortable. Stability of small hulls is often an issue, and we paid particular attention to the behavior of the boat as weight was shifted about. With three adults on board we moved them about in various positions while under way. In general the position of the occupants made surprisingly little difference, with the boat maintaining its horizontal aspect. Even sudden movement from one side to the other did not produce any dramatic change in the boat's angle of heel. But the real revelation was at rest. With two adults both on the same side the boat hardly moved from the horizontal. So we got three adults to sit on the same side gunwale. This is not recommended practice in most sub-5m boats but the Everyman only just dipped the chine below the water level, and the boat remained safe and comfortable. 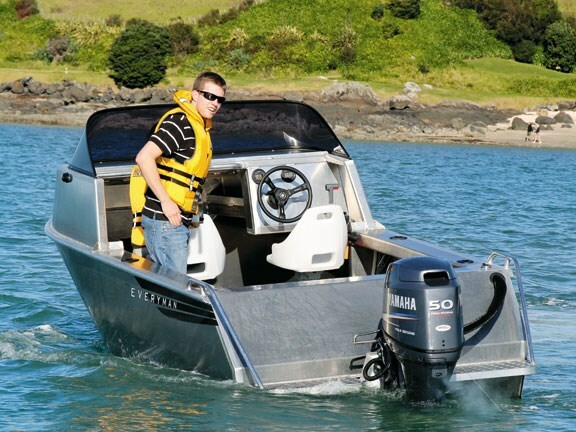 Since this size boat is likely to be bought by first-time boat owners, the lack of tenderness is a major factor. It can be scary having the entire boat lean over unexpectedly. For many of our reviews the manufacturers supply the bells-and-whistles versions with all the options. Understanding the price-conscious market Everyman instead had us test the absolute basic, no-frills version at the lowest cost. The only extra in place on this day was the four-stroke engine. And yet the boat is functional and entirely usable as is. We think it would require absolutely minimal maintenance and cleaning. Options available include a carpeted dash and cuddy cabin, a bimini top, a road cover, a painted hull, and of course the purchaser's choice of electronics. If you are a first-time boat owner who wants excellent value for money, a boat that is stable and safe for the whole family, that looks good, then you'll be hard-pressed to improve on the Everyman 470.